We have officially moved to a new platform. 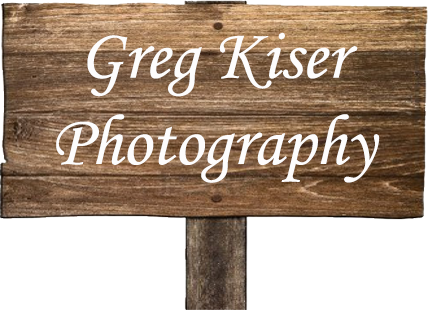 You can catch all of the latest blog entries and the newest pictures at www.gkiserphotography.com. Please update your bookmarks. I have migrated my platform over to my new website at www.gkiserphotography.com. You can read the blog for this trek by clicking here. Welcome back to another installment of Behind the Camera, which is a monthly feature here. In this feature I usually tackle a question that has come up about my photography in the previous days. I'm going to go about this one in a little bit of a different way this month. Since October 18th, my mind has really not been on photography at all. I've just been going through the motions during the second half of the month. When it came time to think about what to write here, I just couldn't formulate any thoughts that I was excited about sharing. In the end, I just decided to talk about what I've been going through and how it relates to my photography. 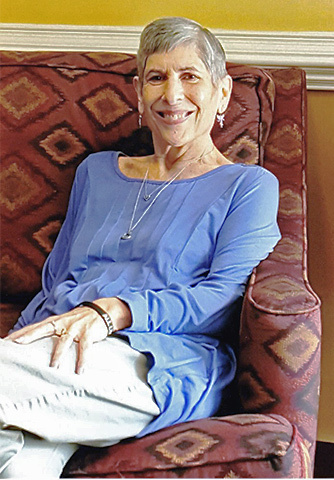 It is with a heavy heart that I share with you that my Mother, Elizabeth Kiser passed away suddenly on the afternoon of October 17th. She was not found until shortly after midnight. I am still processing this as we were very close, and typically I would not put this out there as I am about to do. Honestly, I have no idea where this entry is going to go, but I think that I need to do it in order to get myself back on track with my photography. You see, I owe a lot to my Mother when it comes to my photography, as well as many other aspects in my life. In short, without her assistance and support, I would have never been able to achieve a lot of what I have accomplished over the years. At every stage of my photographic endeavors, my Mom was there with funding assistance and an unwavering support. When I wanted to get a digital camera to make sharing images on the web easier back in 2002, she purchased a Sony FD-200 digital point and shoot for me as a gift. It was clunky, and saved files to a 3.5" floppy disk or a 128mb memory stick. It did start me down a long road of photography. I bought my next camera which was another Sony, but a much higher powered one called the F-828 which was a "prosumer" camera. It was this camera that allowed me to start creating the images that I had learned that I wanted to create. Of course Mom was there every step of the way and wanted prints of everything that I shot. This was the typical Mother thing where all of your art projects ended up on the refrigerator door. I lost track of the refrigerators that she bought over the years to hang my work up. I'm kidding of course, but she did have a growing collection of 8x10" prints which I framed using Walmart frames. For close to three years I honed my abilities as a photographer and started to make waves in the internet world with my images and tutorials. Mom paid very close attention and was always very interested in what I was up to with my camera; so when the time came to think about upgrading she was a natural person to talk with. I let her know that I had reached the limit of what the Sony could do. I was having lots of noise issues and chromatic aberrations which the camera was known for. 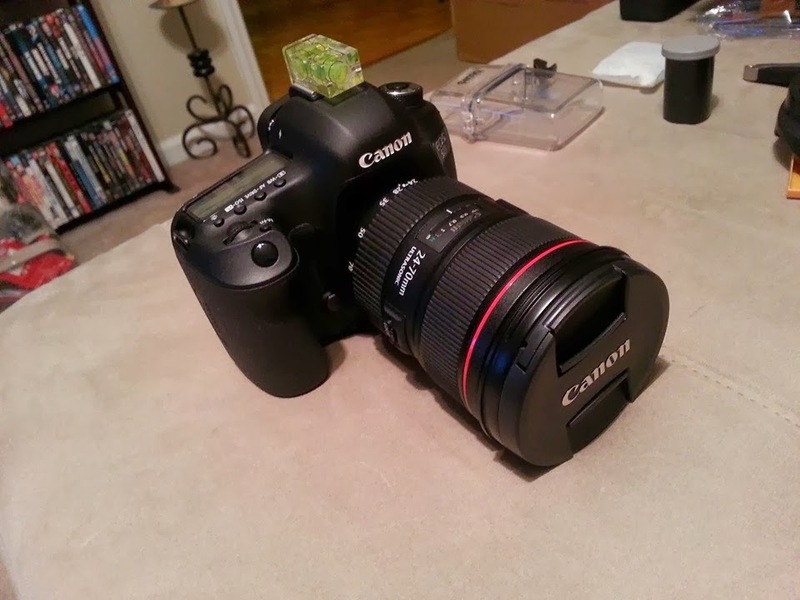 In order for me to create the images that I was wanting, I was going to need a DSLR camera. Seems simple enough right? Well, I was going to have to revamp my entire kit to switch over to a DSLR, and since I was going to be shooting in RAW, I was going to need a new computer. 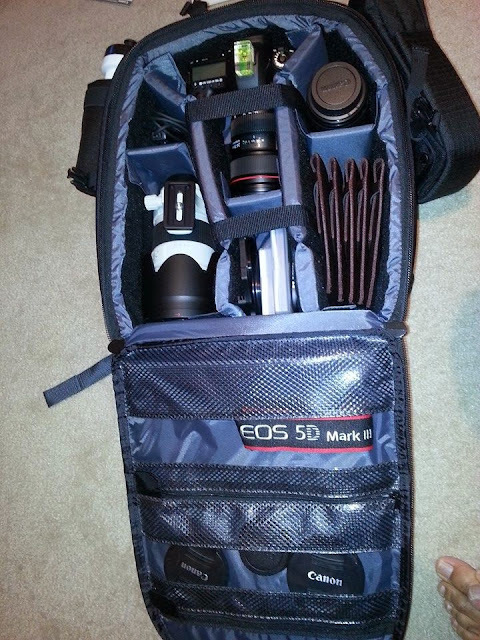 Camera body, a couple of lenses, a new computer, a printer, filters, bag, tripod, etc... carry the five....Holy cow, I was looking at thousands of dollars to get what I considered a workable kit. I talked to her for hours one afternoon and shared with her what I was needing, and started asking how I was going to afford such an investment when I wasn't really making any money with photography...at least not on the level where I could justify that kind of expense. After I babbled on for a while she simply stated make a list of what you need and send me an email. I set to work putting that list together with the help of B&H Photo and Dell Computers. I think that the ending figure came to just shy of 10 grand. I prioritized what I would need first and send the list. Without blinking, she said order it and it would be covered. I wasn't expecting that, but there it was. I had a complete Canon DSLR kit with everything that I was going to need on the way in time for an Alaska trip I was planning. I had just enough time to figure out how to work the camera before flying across the country with it. By this time, her walls were filled with 8x10 images that I had shot over the years and I was figuring that there was no way she would want more, but she did. In fact, she started to like my sunrise pictures and started telling me that she was going to buy some of my new images as I added to my collection. 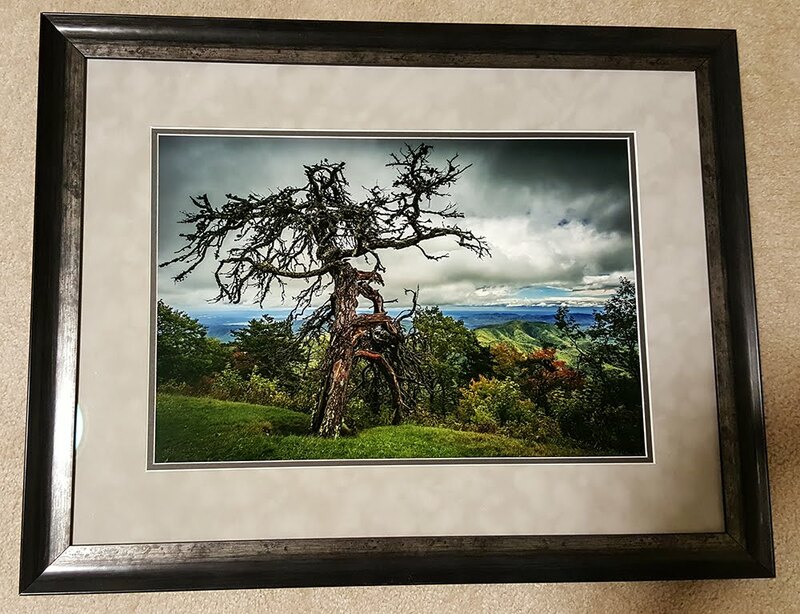 I felt really bad selling her images shot, processed, and printed with equipment that she had bought but she would have it no other way. She got a hefty discount, and basically just paid for framing, and occasionally I was able to make these prints gifts to her. Regardless she kept adding to her collection. What made this so amazing was she was living in assisted living at the time and had an efficiency apartment with two main rooms. She had prints on the walls that were 17x26" which were then matted and framed. It was crowded, but it did look good and she got a lot of compliments on her collection from everyone that came into her room. When 2011 rolled in and I had gotten burned out with photography, she was fine with me selling everything off and using the money to start another passion that was about to be developed. 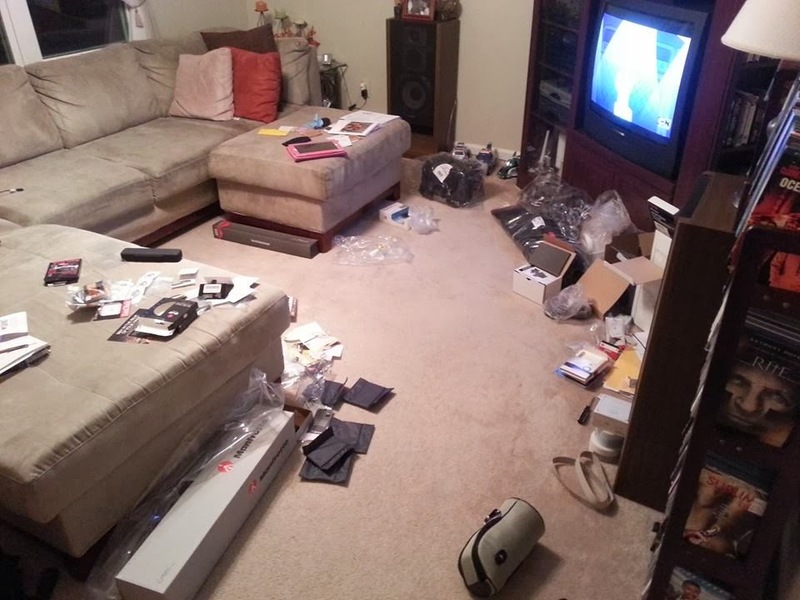 I found a buyer for every last bit of my equipment who came with a pickup truck and took it all from the spirit level on top of the camera to the ONE HUNDRED POUND printer I had been using for so long. Even though I was out of photography, she still displayed my work proudly in her apartment and would talk to me occasionally about my photography, all the while still supporting my new passion of cycling. For those that don't know, Mom had Multiple Sclerosis which is why she was in assisted living. 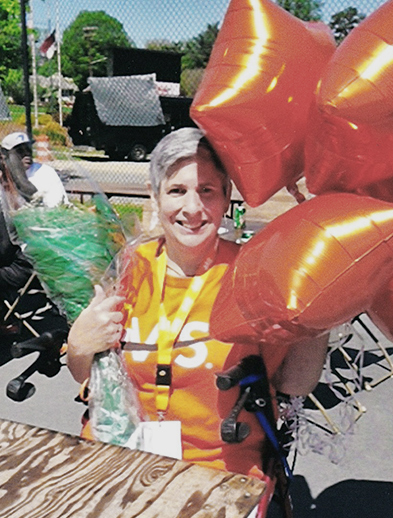 She was diagnosed in 2003, and by '05 she was in the bed more than anywhere else which prompted her to move out of her house and into an independent living facility. I found this out when I called her house and there was no answer. I called the cell phone and she said that she hadn't switched over the phone yet. She liked to do things on her own. By '07 she realized that she was needing more care than her current situation would provide, so she let me help her get into an assisted living facility. She would remain here for the rest of her life. With MS, she would go through ups and downs and at times be very active, while others be completely bed ridden. She made the suggestion that I participate in the Bike MS, Tour to Tanglewood which benefited the NMSS of NC which she leaned on so heavily in the early years of her diagnosis. It was the least that I could do to do that, and it became a yearly thing for me to participate in. It turned into a great idea as I was able to raise many thousands of dollars for the NMSS and brought a lot of awareness to folks. 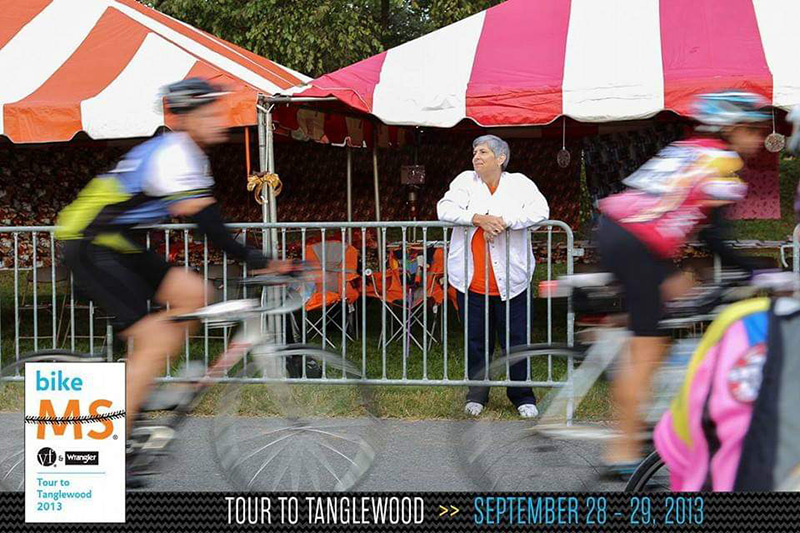 In 2013, she was feeling pretty good and actually worked the Linking Lives Tent which coordinated with the ones suffering from MS with the riders that were riding for them. She was also in training to do one of the MS walks on her own. Her goal was to do it unassisted, but she did have to use a walker to walk a bit over a mile. This was huge since a few years before she was pretty much a prisoner of her bed or a power chair. So three days later, B&H delivered my new gear to the tune of $14,000. Did I mention that I refused to accept any more money? Well, I was grounded and sent to my room until UPS came. Once again, I was back in business thanks to my Mom. I went at things much slower than I had before and did it for me rather than to try and make a business for myself. She was supportive of that plan, and still made me make prints for her...which she insisted on buying from me. I don't know how she manged to get all of these prints on her walls since I was now printing everything for her at 13x19" which was my favorite size. By the end of 2014, I was just not happy with my photography anymore. I didn't like it was going and I was feeling very guilty for the money that Mom had spent on my gear. She wasn't concerned and supported me putting more of my time and energy back into cycling once again. This time I left the photography gear in the closet and would go back to it occasionally for a picture here and there. It wasn't until 2016, that I found the missing piece to my happiness in photography. I ended up with Lightroom after a computer crash forced me to invest in a new computer. I learned how to control the color replication to the printer which had always been a problem. This springboarded me right back into photography once again. Mom was thrilled and tried really hard to understand color management while I was explaining my breakthrough to her. She never figured it out, but was excited for me, and the prospect of new pictures. 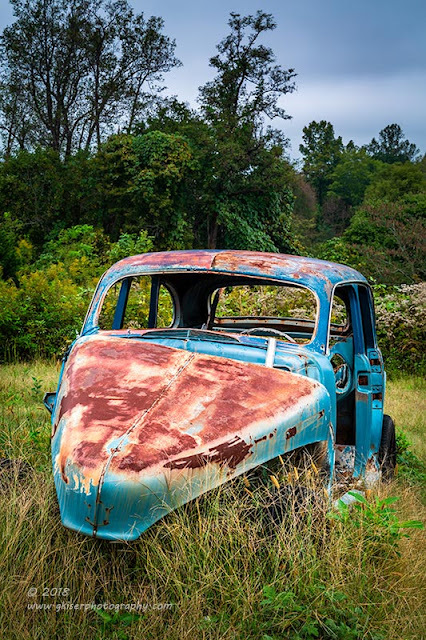 The funny thing was, I was slowly starting to wear her down with my old rusty cars and she was starting to appreciate what I saw in them. 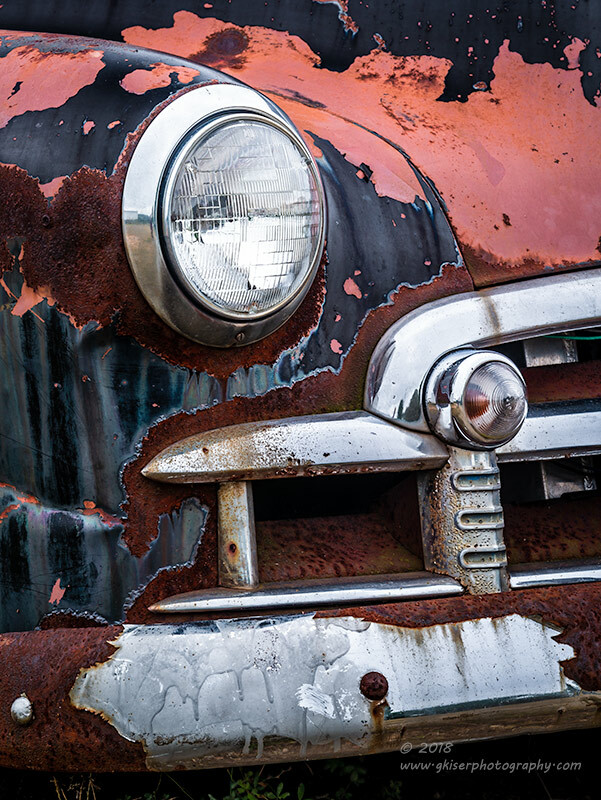 She even had me make her a print of an old pickup which turned out really nice and she really liked it. I could never get her to fully commit to a black and white image, but she did like a few of them that I did. She absolutely adored anything dealing with sunrises or sunsets, and had started to like the waterfalls that I did as well. Looking back, I would get an email after every blog post that I did, and I could count on it like clockwork. Based on what I had shot I could pretty much tell what the email would say. 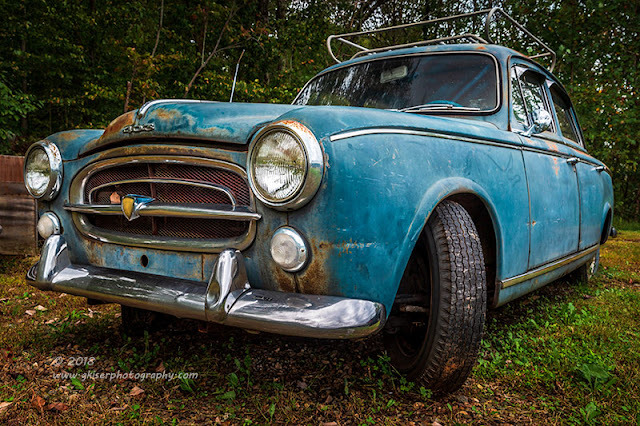 I could always expect trips to the Blue Ridge Parkway to result in "I want everything that you shot" to show up. If I did waterfalls, she would send "I'm glad you got to go out and shoot your moving water, I found a lot of them really relaxing to look at." If I had shot barns that day, it would go a little something like this: "I didn't see anything I had to have from this one, but they turned out great." 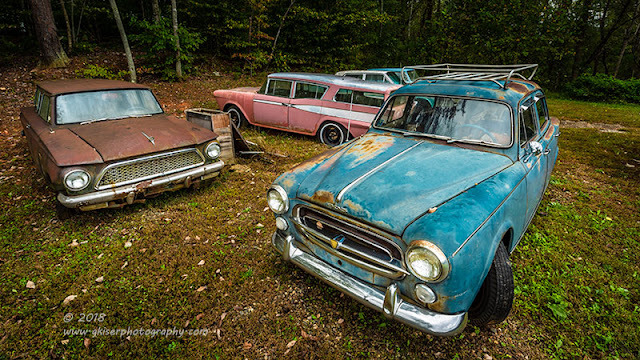 The old cars were always a toss up though. It would go like this: "I just love your titles on these, but they are not my cup of tea," or like this: "I'm starting to see the personality in these cars and I can relate based on how I am feeling right now." My last two treks didn't have any emails. The first one, she was really busy doing things to get my Grandfather's house ready to sell and I didn't really expect her to sit down to read the entry until she got to a point she could breathe. I was really looking forward to what she thought of the old mill that I had shot. I was expecting this to fall in the category of "I want the color one, but I'm just not a fan of black and white." I knew that she would really like the colors that I captured with the reds and blues. She also was developing a like for the long exposure shots I was doing. I'll never know what she thought of this shot, but I know she saw it at least. The trek that I took next was on the morning of the 16th. I am pretty sure that she never saw this one at all. I didn't get a chance to process the images and do the web end of it until late that night after work. She left her apartment early in the morning for an appointment and died later that afternoon while still away from home. I can say with some amount of confidence that this set of pictures would have hit home with her. 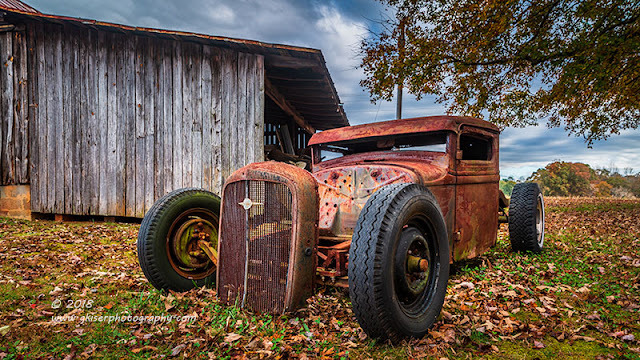 She would probably say that she still didn't care for the old rusty hunks of junk, but the Ramblers were something that sparked memories for her. 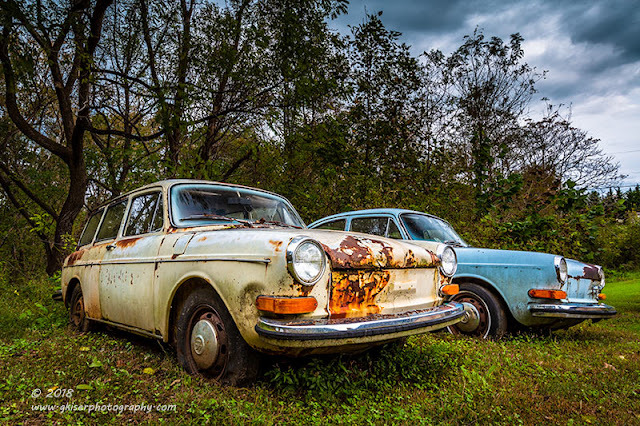 My Grandfather had a convertible Rambler when she was growing up, and I'm sure that would have made at least one of these images something that would make her list of "one day, I'm going to have that on my wall." It really makes me sad that I've lost my biggest cheerleader, and that she will never know just how far I might go in photography. I do know that I owe it to her to take it as far as I possibly can. I remember clearly years ago telling her that I couldn't necessarily believe her rave reviews of my photography since she used to be proud of the scribbles that I drew in elementary school. She was my Mom, she was supposed to like whatever I did. I would shrug her opinions off many times and search for validation from people I didn't know. Somehow, I felt that those opinions carried more weight. I feel guilty about dismissing her opinions through the years though. She had earned the right to have a voice in my photography because without her, I would have probably never even had the chance to see what I could do with a camera. Life is precious, and the world has lost a wonderful woman. I have lost my Mother, my biggest cheerleader and supporter of everything that I have done, even the stupid things. I'm going to miss you Mom, and I promise to continue down the path that you have so graciously paved for me on several occasions. I'm going to miss you, and I love you. Thanks for joining me on this emotional ride. This is about as "Behind the Camera" as we can get. I will get back on track as soon as my creativity comes back. For now, my heart is broken and I am having a real hard time tapping into my artistic side. There are a lot of things on the horizon though. We have workshops starting up in a month and a new website that is currently trying to be launched. I'm hoping by the next installment of Behind the Camera, I am back to some semblance of normality once again. After this past weekend, I was left feeling a little unsatiated when it came to my photography. Yes, I was able to go out and I spent about an hour in the field, but when it was all said and done I had only worked one composition. It turned out nice but I was still wanting more. As luck would have it, I had a meeting Tuesday evening and that meant that I would have a little bit of time in the morning to go out with the camera. To make matters even better, the forecast was calling for clouds and even a possibility of rain. After all of the rain that we have had recently, this meant one thing...WATERFALLS! I started to look at the time that I would have to work with and that put three locations in range for me. That was Hanging Rock, Styers Mill Falls, and Widow's Creek Falls at Stone Mountain. Any of these would look good right about now but just thinking about them caused me to yawn. I've done some fantastic waterfalls here lately and I do enjoy them...but the ones that are close just weren't exciting to me right now. In fact, after working so many waterfalls in the past couple of months I really didn't feel like that was where I wanted to focus my attention. Add to it the fact that I've been to each of these falls more times than I can count and know every composition available for them. I wanted to be creative and shoot something different. 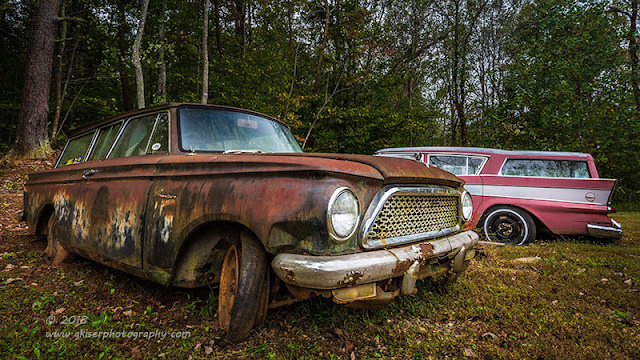 I looked back to a previous trek that took me out to Stokes County when I found three different rusty treasures. I remember driving out to that location that I passed by Priddy's General Store which made me look back. Thinking about the low clouds I was going to have got me considering a long exposure on the store for a little dramatic flare. I was starting to get a little excited. 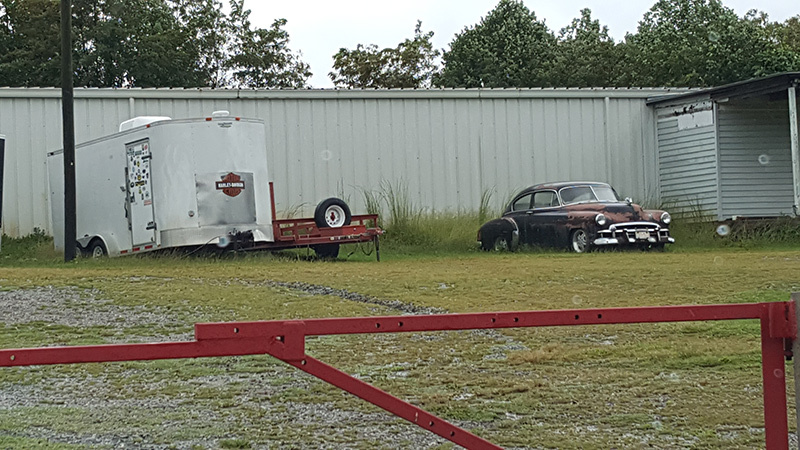 I also recalled seeing an old Mustang behind a house coming back home from the previous shoot as well as what looked like a parts car storage behind a shop of some sort. All within about 10 miles of each other I had three possible locations to shoot rural and rusty subjects. This excited me, and gave me the thrill of the hunt which was missing from waterfalls. I started to plan out my morning which would include dropping Sierra off at school and then heading to Danbury. I wasn't quite sure what order I would work things in, but was really interested in shooting the General Store. However, looking at it on Google Maps, I was a little concerned about compositions and felt that this might be a long shot subject. I was going to be close and figured that I could at least give it a second look if I didn't shoot it. The Mustang would be a sure thing as long as the owner was home as I would need to get fully into the property to shoot it. The shop was a bit of a question mark since I had only seen it for a fraction of a second driving down the road. 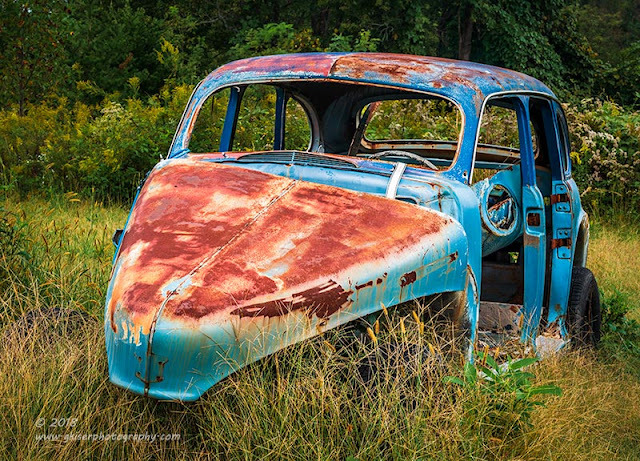 I saw rust, but didn't know the compositions or even what types of cars would be present. Based on all of this I decided to start with the Mustang and then decide from there where to next. After dropping Sierra off, I took stock of the sky. It had been phenomenal at the start of the day and the clouds were still really great but losing the definition. This was going to be just fine for the automotive stuff and I didn't feel bad about putting off the store since the sky wasn't good for long exposure work just yet. I made my way out to the area where I remembered the Mustang and the shop to be. It was going to be difficult to find the Mustang coming from this direction as I would have to look behind me so I figured first come first served. As luck would have it, I found the shop first and slowed down. I could seen about a half dozen old cars in the back and a couple of them I didn't recognize the makes of. 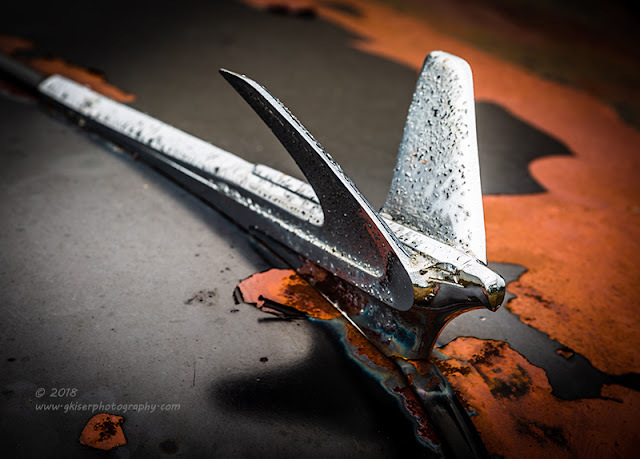 They weren't quite the rusty messes that I like to work with, but I saw some potential. It was a shop they were behind and I could see that the doors were open. This was going to work out very well I thought. I pulled off the road and took stock of the cars in the back once again before finding a place out of the way to park. As I was parking, two guys came out of the shop with that look of questioning on their faces that I know ever so well. I got out of my truck and introduced myself and shared why I was there. They seemed cautious of me, but were willing to let me shoot some pictures which was all that I needed. I grabbed my gear and went around back to see what was there in detail. I saw four cars up against the tree line that were definitely American and I was able to determine that these were Ramblers. I just don't see that many of those around anymore, and it was a pretty cool find for me since my Grandfather had driven one many years ago. 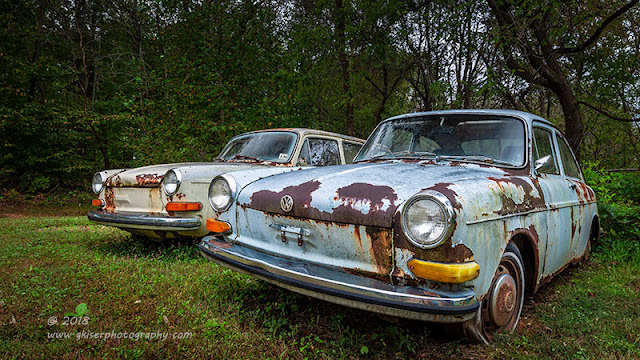 On the other end of the lot there were two cars that looked German and turned out to be Volkswagons. In the middle there was a modern Mercedes V12 car which I cared absolutely nothing about, but beside it was a blue car I wasn't familiar with. The emblems were long gone from the back, but doing a little further looking I realized that this was a Peugeot 405 which was another really cool find! The last car was some type of personal car which held no interest to me, but was cool at any rate. I went with the easiest to work with first, and that was the pair of Volkswagons on the far end. For these, I opted to fit my 24-70mm lens and the Singh-Ray Color Combo Polarizer. That gave me a great deal of flexibility in composition. I found that there was a great tree that was behind the cars which I tried to include in several of the compositions. Also, I saw that the clouds in the sky were getting much better so I was able to do compositions from down low that included the sky. What I had to worry about was a shelf and a couple of trash cans on the far side of the cars. Fortunately with some creative compositions I was able to block them out with the cars. I was even able to shoot from both sides relatively easily. As I ran out of compositions I moved over to the Ramblers and started to work them for a while. I tried to get them individually, but that was very difficult to do with how close they were. I found that the better compositions included several of them at once. The trees made for a nice back drop for most of the shots and the sky cooperated with me in the other direction. The held a lot of interest, but I was running into exposure problems. With the front of the cars in deep shadows the sky was overexposing too easily. I added the Lee Filter Holder and then started to work my Singh-Ray ND Grads to keep the sky under control. I started with a 3-Stop and found that was not enough and added an additional 2-Stop. That still didn't give me what I was after, so I swapped that out for another 3-Stop which seemed to work well. I had the soft edge one down lower to soften the line of the hard edge while keeping the cars exposed properly. This seemed to be the key and I moved over the Peugeot and had to get real creative with compositions since the Mercedes was parked right next to it. I worked low so that the smaller in comparison Peugeot would completely block the large Benz. That put a lot of the sky in the picture so I was having to use the ND Grads here as well. I was able to drop down to just a single 3-Stop grad though which was nice. I was about ready to call it a day and go find the Mustang when I started to consider other options. I went crazy and slipped on the 16-35mm lens with the slimmer B+W Polarizer for vignetting concerns. I started working all three sections once again and found that I was getting some very dramatic compositions that included the sky. Of course with the sky, I was having to add combinations of ND Grad filters to keep the exposure right. Regardless, I was getting some very different feeling images while working on the same basic compositional ideas from earlier. I was really on a roll, and loving getting in close and adding a lot of perspective distortion to the images. The fun did eventually dry up and I found that I had run out of compositions. I started to pack things up and saw the 70-200mm lens sitting there looking all pitiful. OK, I'm a real softy and wanted to show it some love. I attached it to the camera and added the Singh-Ray Color Combo Polarizer once again and started to work some isolations. 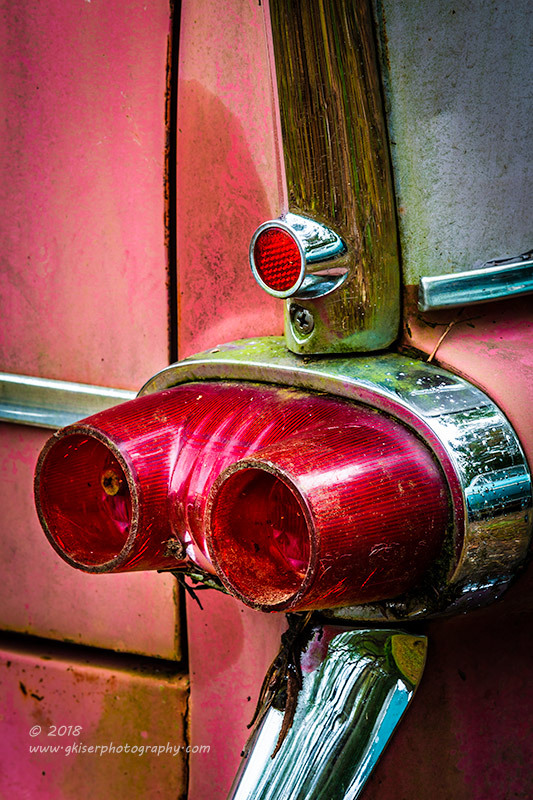 It got rolling with a shot of the taillight on the Rambler wagon which I found quite interesting. That lead to other isolations of emblems and rust. I even started to shoot head on shots of the Peugeot since the front end was quite a bit different than anything in my collection and it was just cool to look at. After roughly an hour and a half on location, I had run out of creativity and the sky was starting to get a little active with some movement. I would be able to shoot long exposures with this sky, but the only way to do that here was to include trees which were blowing too much to try several minutes worth of exposure. 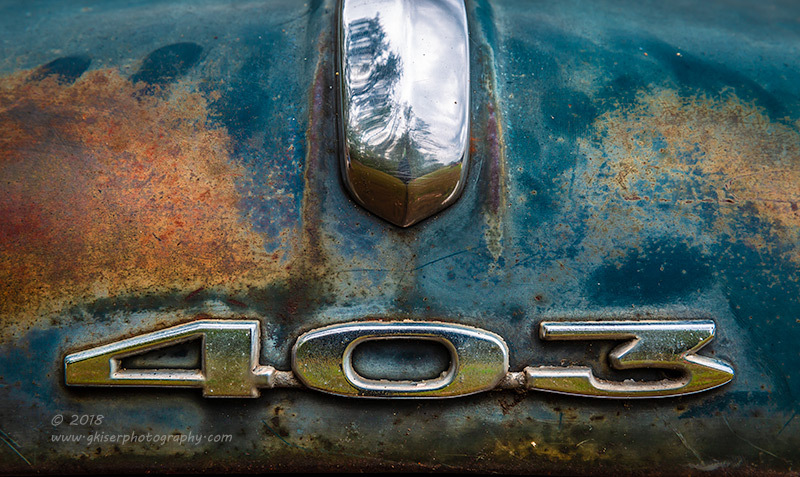 I packed up my gear and thanked the guys once again for letting me shoot the cars and headed off to Priddy's. It didn't take but about 15 minutes to get there and the sky was still pretty good. The problem that I immediately saw was that there was a Tesla parked in front of the store. That wouldn't fit my vision at all. I did take the opportunity to look at how the compositions would work out. Honestly, I wasn't all that happy with what I as seeing. The sky would be a great element, but to include that I would need to include a lot of power lines and some other clutter that I didn't like. The store wasn't all that interesting on its own, although it did have a yesteryear feel to it. With all the things working against a picture of this, and not much really going for it, I decided that this was not worth my time. I looked at my watch and wondered if I had time to try and find the Mustang at this point. I really didn't since I was going to have to talk with the owner to ask permission. The day was done, and it was time to get to work. I spent the day not really having a clue in the world about what I had captured through the morning. I was hoping that I had about six good images out of the bunch. I wasn't quite sure how many I had captured since the last time I looked I was at 60-something frames. When I got home I went right back to the office to upload the pictures from the day. I had to wait a bit because there was an update ready for Lightroom which needed to be installed. That took a little while, and then I finally was able to upload the images from the day. I was surprised to see that I had 83 frames captured in less than two hours. My hopes were for eight or nine keepers to turn up out of the bunch. I went through the culling process and kept tossing images out and when I was finally happy with what I had in front of me, I was looking at 21 images! That is a 25% hit rate which was amazing. I eliminated a few others as I was doing the processing and finally came away with a total of 14 keepers from this trek. I would say that is a pretty good haul for a morning. It definitely satisfies my creative desire from the previous weekend. I am very happy at this point, and can now look forward to the next trek to see what I will capture then. As a reminder, if you are interested in trying out some of the filters that I use, be sure and visit www.singh-ray.com and remember to use the code "KISER10" when checking out to get 10% off of your order. I sure wish I had that code when I was purchasing my filters years ago. To set the scene, the Southeastern US is getting over Hurricane Michael which hit Thursday afternoon. While we didn't get hit nearly as hard as the Panhandle of Florida, North Carolina received a great deal of rain and some very high winds during the mid afternoon hours. 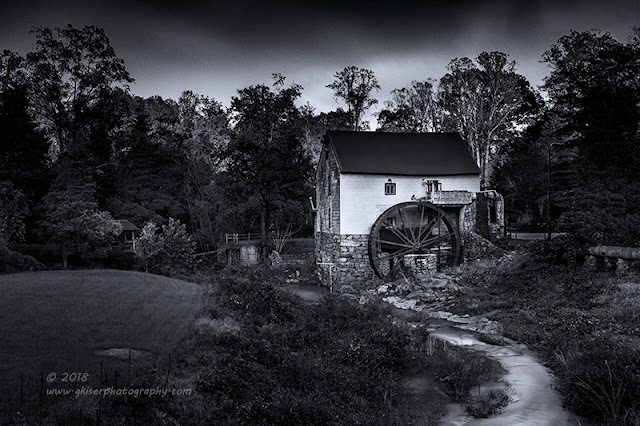 My plan Thursday was to go after work to the Old Mill of Guilford to take advantage of the dramatic clouds and the extra water that should be in the stream. Well, shortly after 4, I got word that all units were being held over to be a storm response team. By 5 I was out answering calls. The hurricane passed through quickly though and by the time I got out of the office the rain had stopped. The clouds were wonderful, and the lighting was just what I was after. I was hoping that it wasn't going to take more than an hour to deal with the extra call load. Boy was I mistaken! I was at work until 11pm dealing with downed trees and such. During the time that I was out in the field, all I could think about was how great the conditions were for the composition that I had in mind of the Old Mill. By the next day, the clouds were all gone, and I was back at work dealing with the damage. 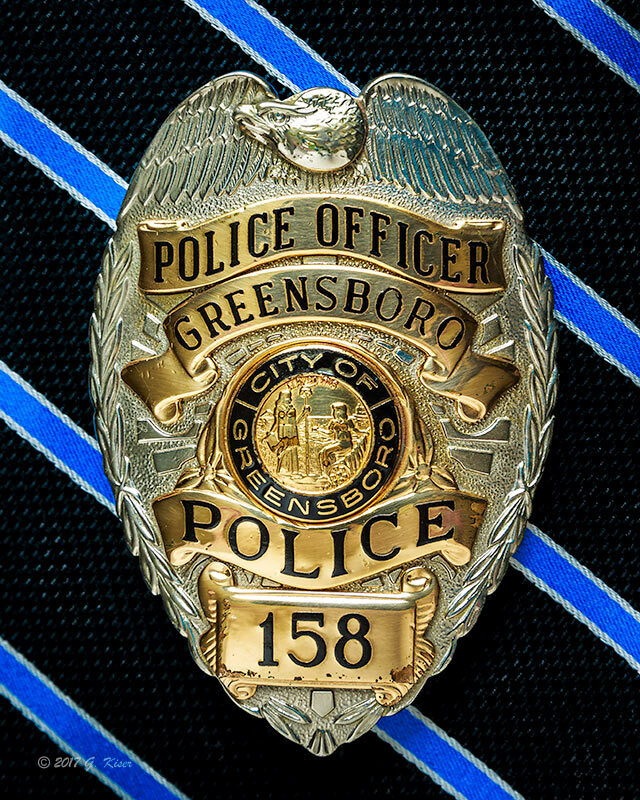 It hit us a lot harder than I had thought while I was sitting in the office prior to it passing over Greensboro. The forecast for the weekend was looking pretty much as expected after a major storm passes though. That's right, it was straight sunshine all weekend long. I wasn't going to get my clouds, and there was even a chance that I wouldn't get any photography done. When I got home on Friday, the sky was still crystal clear and while I had a little time to go out with the camera, I really saw no need. I decided to mow instead. While I got the mowing done, I ended up doing it under one of the prettiest sunsets I've seen over the house. The color was completely covering the sky from West to East. I was a little upset that I wasn't out with the camera, but it did get me thinking that I could possibly catch some really nice sunset colors over the Old Mill instead of the clouds that I was after. If I was really lucky, I would hit magic light and have the mill bathed in warm light while the sky was shaded in subtle hues. I started to look at the weather predictions for Saturday and found that there was supposed to be a really good sunset, or at least the conditions were favorable for a good sunset. Knowing that the water would still be up, I decided to give it a shot and hope that the few clouds that were forecasted would actually pick up the color. In the meantime, I would have the chance to work on some video productions that I had been planning. I started early on Saturday morning setting up my studio. I had my bag set up and my video camera (cell phone) on a tripod elevated just right. I was going to do a tour of my bag with all of the contents. I started the recording and started my presentation. Of course, I goofed when I started so I went and checked everything and made a few adjustments before starting to record again. This one went great. I was going through everything in the bag and telling the purpose behind each thing and why I had it where I did. At the end of the production, it looked like I had been talking for about 35 minutes. Perfect! I went to turn off the recording and was greeted by a black screen on the phone. I opened it up and found that the video had stopped long before I had finished, or even gotten into the good stuff. I noted that there were some alerts that had popped up and I thought that might have stopped the recording so I put the phone in airplane mode before starting again. Not wanting to spend another 35 minutes talking again, I decided to reduce the content and just focus on the filters that I use. I was rolling and feeling really good about things and stopped at the 15 minute mark to check my progress on the phone. Black screen again! It stopped at the 5 minute mark, which was exactly where it stopped on the first one. Now I knew that I had only 5 minutes to work with for a video. I thought about doing one more take but this is how it would have gone. Not wanting to sound aggravated I opted to just put things away and try again another day. For the rest of the morning, I took care of some things on the computer and kept an eye out for the weather at sunset. It was promising that there were some nice puffy clouds rolling in, but the sun was too harsh to take advantage of them. I was working out plans for what kind of compositions I would try at the mill, and even started thinking about alternate plans just in case that didn't work out. When it was about an hour and a half before sunset I looked outside. There were some very thin clouds working their way from the West. The East was pretty blank and that was the direction that I was going to be shooting. I decided to throw caution to the wind and give it a try anyway. I arrived just about an hour before sunset, and took a view of the scene. The banks of the stream were grown over more than I was expecting but the water was at least flowing well. The mill was mostly in the shadows which was not really to my liking. However, on a cloudy day, it would have worked with the sun higher in the sky as my original plan had been. It is nice to know that the concept is valid, I'll just have to wait to get another chance to shoot it in those conditions. Since I was here I did set the camera up. Looking at the available compositions I opted to go with the exact one that I had previsualized a few days ago. I positioned on the bank near the roadway, but over the culvert that took the stream under the highway. I made sure that the tripod was stable in the moist ground and mounted the camera with my 24-70mm lens. I was shooting water, so I added the B+W polarizer which is a slim mount and allowed me to mount my Lee filter holder in front of that. I knew that I was going to have to pull the exposure down on the sky to make this work since I only had some very thin clouds in the sky to work with. I started with two different ND Grads and shot with 5 total stops of light reduction. This was working, but I wanted a different effect. I wanted the thin clouds to move a little and give some smoothing to the sky to match the water. I left my 3-stop Hard Edge Galen Rowell ND Grad attached and added another Singh-Ray Filter, the 10-Stop Mor Slo ND Filter. This was what I needed to really slow the exposure down. I figured out my exposure and shot at ISO100, f/13, at 2.5 minutes. The resulting image looked like it had some promise with the elements that I was after being represented. I worked on some other variations on this theme with different exposures and compositions and ultimately decided that the sky was just getting more and more boring. I packed up and cautiously made my way back along the railing trying not to slip down the embankment. I looked around for more compositions and more specifically, isolations. The lighting was not good on the mill for this and I ended up not pulling the camera back out again. I decided to leave right at sunset. I had managed to get a total of 17 images from the evening. It was all one angle really, so that was a lot of shots, and I was looking forward to seeing what I had to work with. My last set of three shots was looking like the best of the bunch though and they were vertical shots. When I got home and loaded them in the computer, those were still my favorites. However, I really wanted to see how the two long exposures I did turned out. These always look a little off as digital negatives, and I wanted to see just what I could do with them. I picked my favorite of the two which happened to be the shorter exposure of the two (151 seconds vs 210 seconds). I started to work with it and the more I developed the shot the more I really liked it. In the end, this was my favorite shot of the day, and I didn't even bother processing the others. When I pulled the image into Photoshop to prepare for the web, I decided to try a quick conversion to monochrome to see how I liked it. I played with it a little bit and decided that I had a nice moody image, but something wasn't quite right about it. I started to play around and added a blue filter to see what that would do. It gave a slightly cool tone to the image which I really liked. I actually liked it enough to add the monochrome shot to my keepers from the evening. It is a little bit of a moody piece where the color one has a completely different feeling. I think that they both say very different things and I like that about them. It wasn't the image that I had previsualized, but I had proven to myself that the concept would work with the right conditions and I managed to pull a pretty good image out of the lackluster evening thanks to some filters on the camera. If you are interested in Singh-Ray filters, visit them at www.singh-ray.com and use the code "KISER10" at checkout to receive 10% off of your purchase. It is officially Fall here in NC according to the calendar. The leave should be changing, there should be a certain brisk quality to the air. I should be in the mountains photographing the leaves somewhere around 4000 feet. The reality here is that we are still having ninety degree days, the trees are still green, and there is no telling when Summer will actually end. This is really messing with my head as I was getting into the Fall mood in the closing days of September. When it came to deciding where to travel for pictures, it should have been an automatic answer of the Blue Ridge Parkway. It was not going to be quite that easy to decide. I really didn't want to dedicate a full day to traveling to the mountains for more green. The rainfall has been minimal, so waterfalls weren't really an option either. 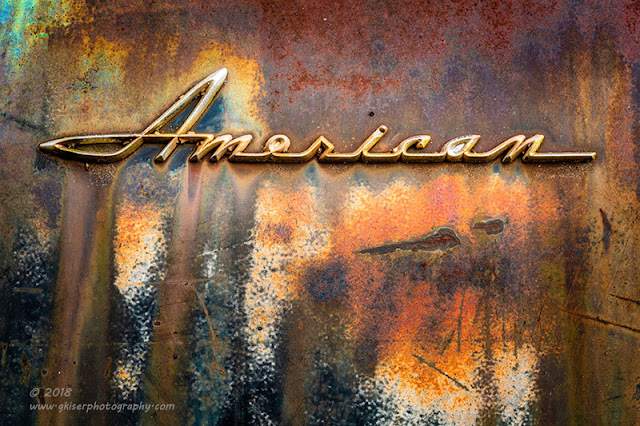 Fortunately, I have been getting back into my mode of shooting old cars and trucks. That gave me a viable option. I also had some new locations that I wanted to try out as well. These are two places that I have seen before and filed away in my mind for when the conditions were right. In both cases, I wanted overcast skies and a low sun. Come Friday, I had not really had any time to think about what or where I was going to be shooting. I had no idea what the weather was going to be, and just didn't have the gumption to really go out at all. I guess this is what happens when the week has some unexpected ups and downs along with considering a complete rework of my website. Not to mention, I am starting to really put a lot of thought into where I could do a workshop for a small group of photographers. My mind was pretty much fried. As I was getting ready for bed I checked the weather and it showed cloudy conditions to start the day, but partly cloudy fairly early in the morning. It would likely be a good landscape day, but I just didn't want to photograph any more green landscapes right now. There weren't going to be enough clouds to do what I was wanting to do with the old cars that I had found. More than likely, I was going to be out of luck on Saturday and would just stay home. I wasn't arguing with that one bit actually. I did have Toni wake me up before she left for work so that I could check the weather one more time. A quarter of five in the morning happens all too quickly on a Saturday morning, but such is the life of a photographer. She woke me up and I checked the weather. It was looking pretty much the same as it was showing the previous night. I rolled over and went back to sleep. I figured today just wasn't going to pan out at all. About an hour or so later I woke up again and started to think about options to shoot. I looked at the weather again and saw that the clouds were pretty thick outside, and that the partly cloudy conditions were going to be around 70% coverage. I then had the idea to look at a new app that I installed a few days ago. This is "Clear Sky" and shows the detail of where the clouds are, and what kind of coverage is expected. This gave me a different perspective showing good cloud cover until early afternoon. That told me that I was actually able to go to the two locations in Stokes County if I wanted to give it a try. The main location I wanted to try was off of Hwy 8 and was an old garage with a busted Chevy sitting out front. I have passed this location many times and wanted to get a composition, but the lighting had never been right with it. I also knew that I wanted the overgrowth of late Summer rather than just an empty frame rail. 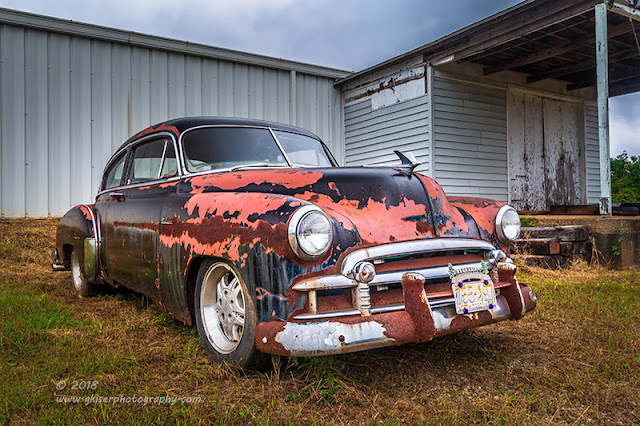 I was running out of time to shoot this car unless I wanted to wait until next Summer. With the weather looking good, I decided to go on and give it a go. I grabbed my gear and set off on the drive into Stokes. The entire way there I was behind a dump truck that was going between 25-35mph despite the road being a 55mph limit in most places. There were no passing zones where I could get around him so I just sat in place and took in the scenery. A bit over an hour later, I arrived at the car. I have no idea who owns the property, but I decided to take my chances with this one and pulled off on the side of the road. I picked out my 24-70mm lens and added a Singh-Ray Color Combo Polarizer to it and mounted the camera on my tripod. 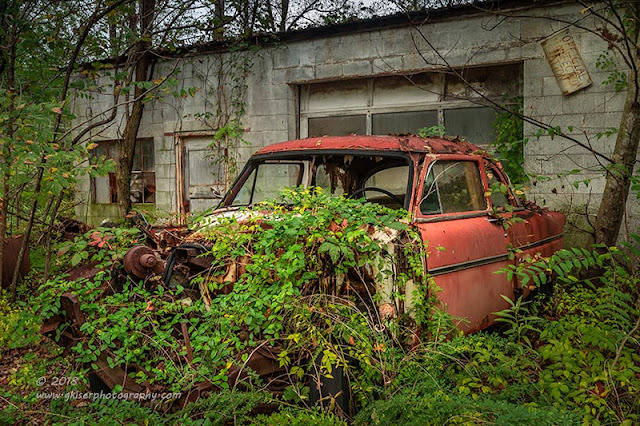 I worked compositions on both sides of the car and tried to include the sign on the shop wall that stated that this was an Official Inspection Station. I found that rather funny when paired with the Chevy below. The problem that I was having with this composition was that to open things up and let them breathe a bit, I needed to include the sky. The sky was brighter than the shadows I was shooting in which caused exposure problems. Instead of hoping that I could recover the shadows, I just went ahead and added a Galen Rowell 3-Stop ND Grad to control the exposure at the very top of the image. This worked very well and allowed me to get the exposure that I wanted on the main subject while keeping the sky from blowing out. After a while shooting with this lens, I decided to swap out to my 70-200mm and step away from the car to get a bit more compressed look to the image. I found myself shooting basically the same compositions with this lens. Without the perspective distortion, the car seemed to disappear into the background of the shop. In the end, I didn't like any of the ones that I shot with the long lens. In fact, out of thirty some pictures, I ended up only liking one enough to keep it. This was part of the reason it took so long to shoot this car. I knew that getting a good composition was going to be difficult with the lay of the land. I am quite happy with this image though, and it captured everything that I wanted it to. I seemed to end this one rather abruptly. When I decided that I was done I went back to the truck and broke down the camera rather quickly. I was getting sweaty and hot which was just not cool at 10am in the Fall! 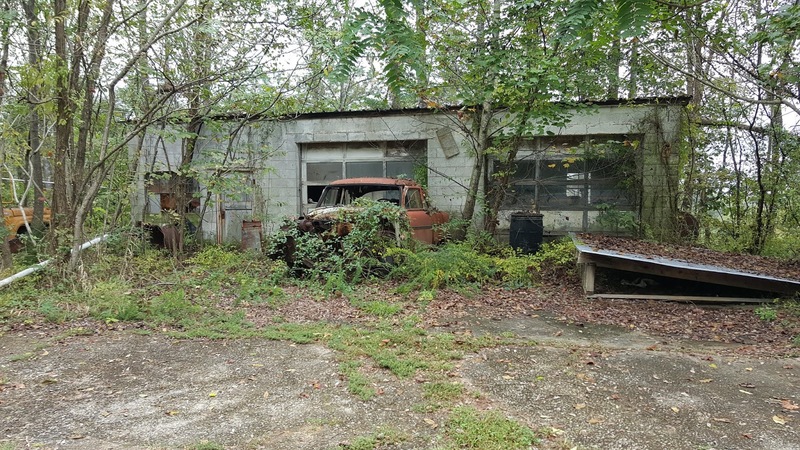 I got back on the road and decided that I would check out another location that I had scoped out a few weeks ago further into Stokes County. I had pinned the location on my phone so I just let it direct me to the location. I didn't have a lot of hope for this location since I was expecting it to be gated like when I saw it last. 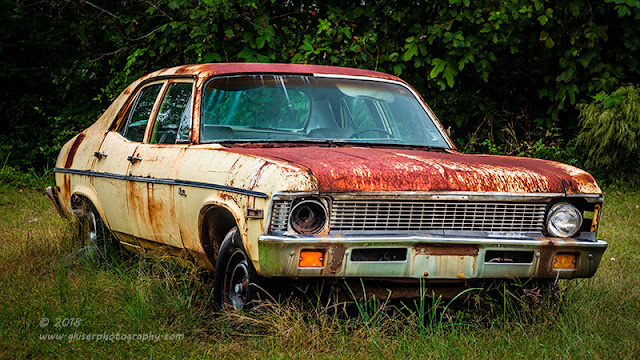 The car was sitting in front of a pretty bland commercial building, but it did have grass growing up underneath of it at least. My plan was to shoot with the 70-200mm lens with possibly the 2X teleconverter attached. That should isolate the car well enough from the road. When I got there, I was actually surprised to see the gate open and a truck by the corner of the building. I didn't drive fully into the property though thinking that there was a good possibility that the gate might need to shut while I was shooting if I could get permission. I parked and started walking up to the shop. I saw no movement or signs of life. I knocked on doors to no avail. I looked around and figured since the gate was open, and there were no fences I might be able to stick around and shoot really quickly. I grabbed my camera and mounted the 70-200mm lens as I didn't want to get too close to the car. I had also seen a couple of other old cars that looked promising as well which I could do easily with the long lens. Of course, I added the Singh-Ray Color Combo Polarizer since I was dealing with glass and metal. I got everything set up and turned the camera on as I heard a lawn mower coming down the road. By this stage in my tenure as a photographer I knew a lawn mower driving on the road toward where I was could only mean one thing. The pavement needed to be mowed. (Pausing for laughter). It meant that the property owner was on the way to talk to me. This could mean that either I was going to be leaving shortly, or I was about to have better access to things. As the mower turned into the driveway I knew I had pegged the situation. I made sure that the tripod was stable and I walked over to meet him. I wasn't sure how this was going to go, but I introduced myself and explained why I was there. He ultimately gave me permission to shoot the cars out in the open area of the lot which included the Chevy that I had seen earlier as well as the shell of a Nash, and a Chevy Nova just on the side of the building. This was great news, and I was very thankful for the opportunity. It did come with one caveat though. It appeared that he was mowing the yard while I shot the cars. I get it, I really do. I would want to watch a stranger doing anything around my property as well. We managed to stay out of each other's way for the duration of the time that I was out there. 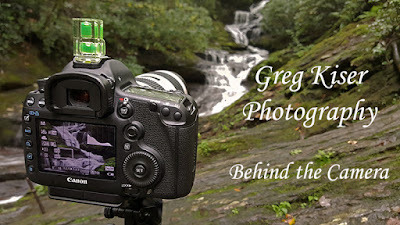 Now that I had permission to be on the property, I was set to do more than just a quick overall shot before moving on. I had the long lens on, and did a couple of shots that I had previsualized when I had originally found this car. They weren't all that great, so I moved on to doing some more intimate shots of the sections of the car that particularly interested me. 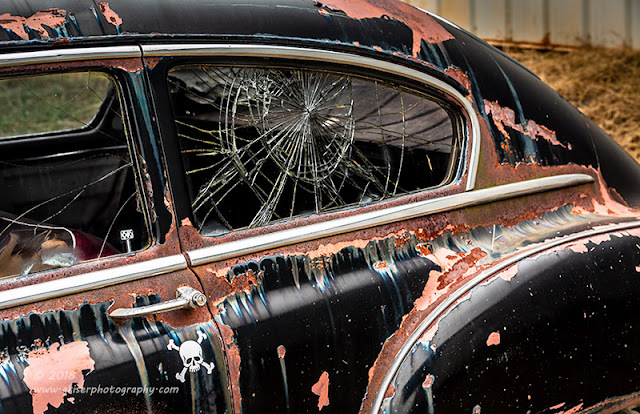 One of the sections that really caught my eye was the broken quarter window on the driver's side. I loved how the glass was shattered and it paired so nicely with the patina on the side of the car. As an added bonus, there was a skull and crossbones decal on the door under the handle that really set the tone for what this car is...or was. While I was shooting my intimate shots, I moved to the front of the car for my trademark headlight/grill shot. Typically I would do this with my normal lens, but since I was usually zooming to nearly 70mm I decided to just keep the long lens attached. It worked just fine this way, and I managed to get a nice composition from the corner of the car. The chrome really stood out against the black paint and the rusty undercoat. The lines all seemed to work together to form an abstract design that flowed. Oddly enough, there was what appeared to be chrome paint on the bumper corner from an earlier repair possibly. I was pretty sure that I was done with this car for now. I needed my 24-70mm lens to try some other compositions, but before I switched that lens in, I wanted to work on the Nash that was parked on the side of the property. This was just a shell and a hood, but the blue color along with the rust tones were just perfect against the trees in the background. I knew I was going to need the long lens for this since it was parked very close to a more modern minivan and I was going to need to cut in close to avoid that. The trees were also taking up a very small section behind before dropping off to show power lines and a house across the street. I found this a very hard vehicle to form a composition with. 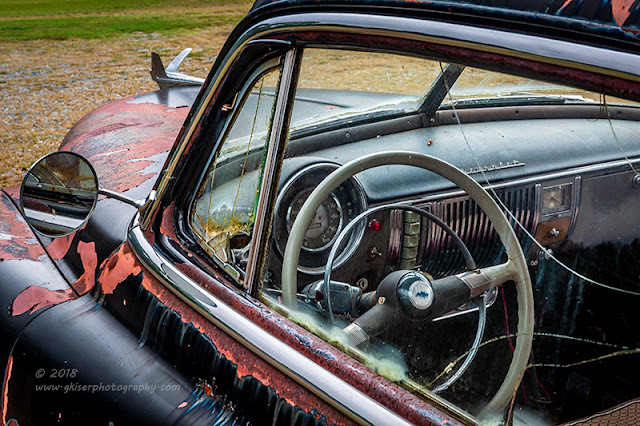 The hood was angled off to the driver's side which pretty much dictated that I shoot from that side. This was fine since there was a long bungee cord holding the hood to the A pillar on the passenger side. It distracted from the composition way too much for me to want to shoot that side just for that reason alone. 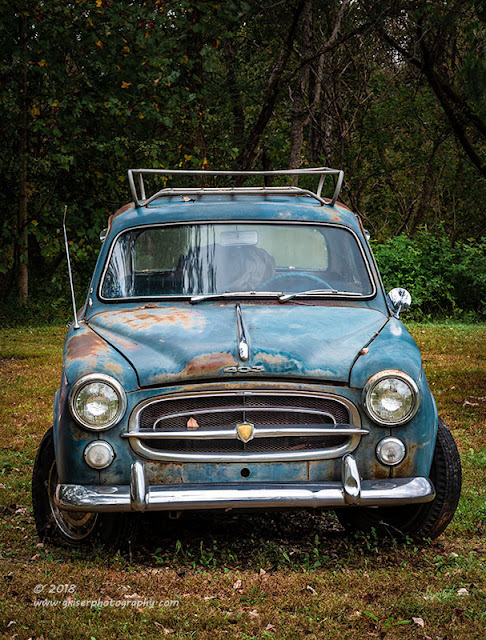 The lack of a front end of the car made the hood the anchor for the car, but there were no wheels visible through the grass to balance out the front end. I couldn't really do a full on quarter view since there was very little body. Essentially, I was taking a picture of a hood and a windshield frame. The colors were good, and the grass was tall so I went for it. The sky was not looking great, but for the shot that I felt was really the key view, I was going to need to include the sky. Looking up, I didn't see much definition at all in the clouds. This was not going to be good at all to have a blank void at the top of the image. I flipped on the live view and started to reduce the exposure to see what effect it had on the sky. I was seeing it go from white to gray, but I could still see no detail in the clouds. That told me that it would be worthless to add an ND Grad to the lens as it would just turn the white sky gray. If this was going to work, I was going to have to hope that I could pull the detail out in post processing later on. As you can see, I did capture some detail in the sky here. I didn't do anything out of the ordinary to accomplish this. I just added a grad filter in Lightroom where I reduced the sky exposure slightly, and then worked the "Dehaze" slider ever so slightly to get a hint of definition in the sky. It worked very well, and I ended up with a sky that was worth being in a photograph. The blues in the clouds as well as in the body of the car balanced very nicely with the greens and reds which made up the rest of the composition. When I was done with this, I thought about trying something with my 24-70mm lens, but opted out of it as there was too much potential clutter in the background if I went any wider than what I was already shooting at. I still had one more car to work with. It was a pale yellow Nova sitting on the side of the shop. I was not happy to see that it was a four door version though. I would have much rather shot a two door, but I couldn't argue with the patina on it, so I got to work. I started out focusing on the front of the car against the side of the building. I thought by cropping out the back half of the car I might be able to disguise the sedan body. That image lacked any kind of emotion though and ultimately didn't make the cut. I worked around more and more and found that my standard quarter shot worked the best for this car using the trees as a background instead of the building. 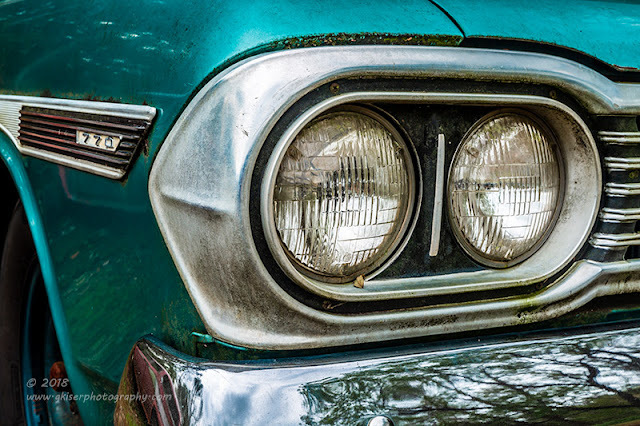 It wasn't a two door model, but with a 16:9 crop, I gave it a little bit of a sleeker feel leaving the primary focus on the front end of the car. I really liked that there was a headlight missing which really finalized the story of the car. I looked around the Nova to see if there were any isolations that I could do. Nothing really stood out to me though. The few areas that I would have typically worked were missing key parts that made the composition in my opinion. I decided that this one view was all the old Nova needed and moved back to the original Chevy out front. I was ready to try some different things with this car now. I swapped the lenses for my 24-70mm while keeping the Polarizer attached. I got in close to the car for a little perspective distortion and started working the composition. I wanted to minimize the building behind the car so I elevated the camera to about seven feet. 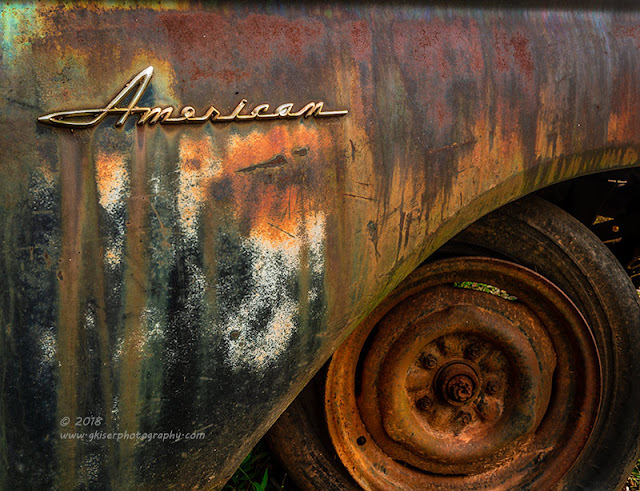 This gave an interesting view of the car and really concentrated on the patina on the hood. More importantly though, the building was minimized. I was able to compose the shot in such a way that I was including the stairs to the door on the right side of the image for a bit of balance in the image. I cropped it as an 8x10 to keep it simple and add a little visual punch to the image. I liked how this composition was looking in the camera, but felt that it might not work as well at full size later on. I really wanted to get down low to show the stance of the car. The problem there was I was going to have to include the building as well as the sky which was still rather bleak looking. As with the Nash, I decided to give it a try and see what I could bring out in post. I dropped the camera down low to the ground and started to frame up a composition. What I found was I was able to get the angle where the two sections met. This was good as it helped give depth where a straight building would not have worked. It helped to lead the eyes to the car which was great. I also had a minimum of sky to work with which was a plus as well. The angle was such that there was no way I would be able to get an ND Grad to work, that was unfortunate. However, as with the Nash, I felt that I would be able to get some detail out of the sky in post. It was worth a try anyway. When I got home, I found success here as well. I did the same techniques as I did with the Nash to bring out the little bit of detail in the clouds. It wasn't much, but it was effective in setting the mood, and providing just enough visual interest to make it worth including in the frame. What was really a gamble of a shot turned into my favorite of the day. Funny how that works out isn't it? 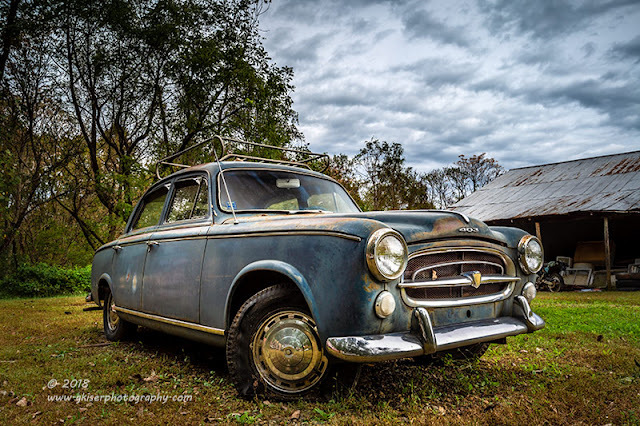 I really do like this piece for the angles that are in it, the lines, the patina, and the shape of the building fully holding the car in the frame. It was similar to what I had previsualized, but so much better in every way. Now that I had my workhorse (for automotive photography at least) lens back on, I set to work picking out more details on the body. 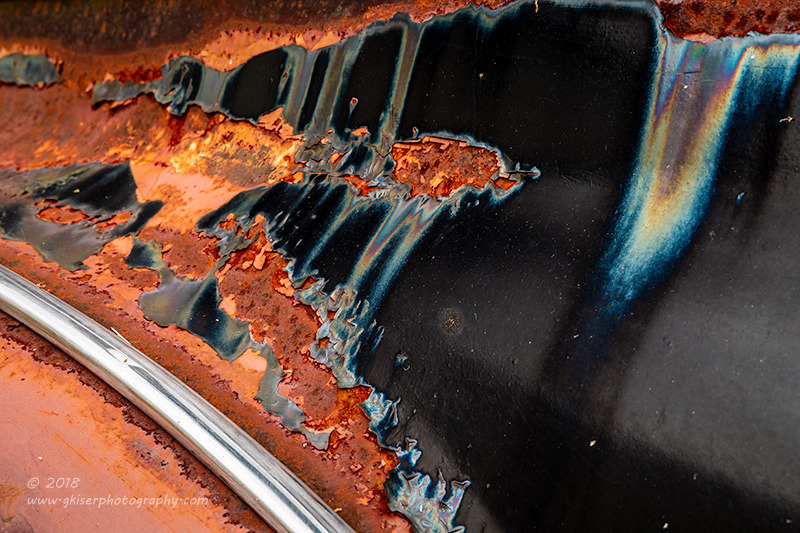 The rust was wonderful, and this car still had a good bit of its chrome still in tact. I started to look for abstract compositions that excited me. The sides gave me all sorts of views that worked well I thought. 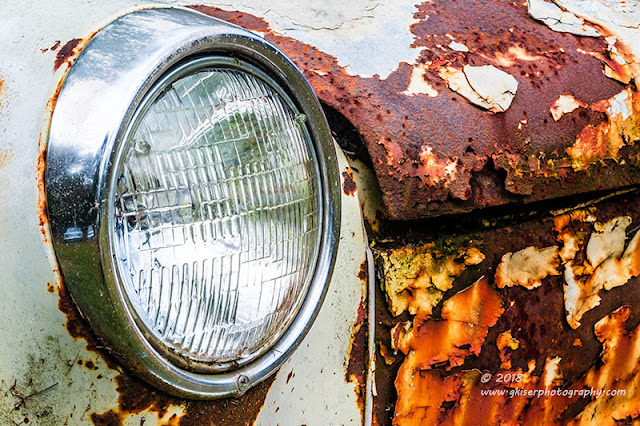 I looked for textures, and transitions between the paint and the rust. 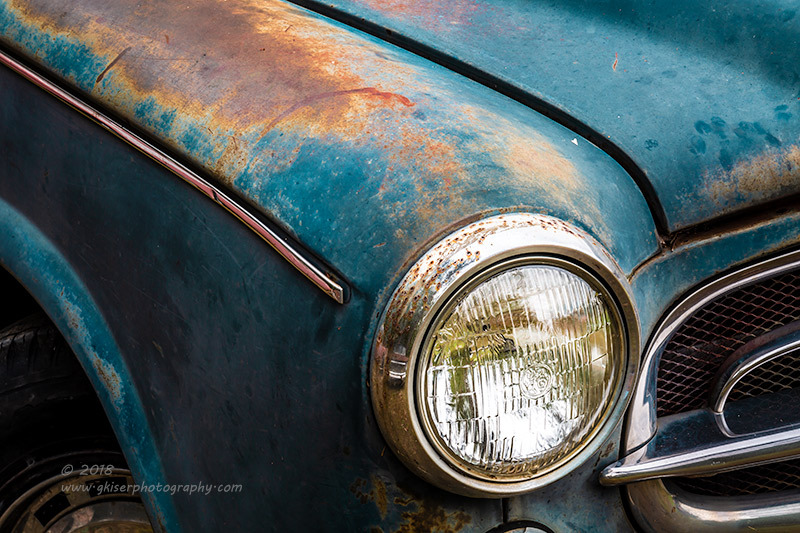 Occasionally, I was able to get the rust stained paint that glistened under the diffused light above. The rear fenders really held my attention with their lines. The chrome trim at the tops of the fenders was great on both sides of the car. 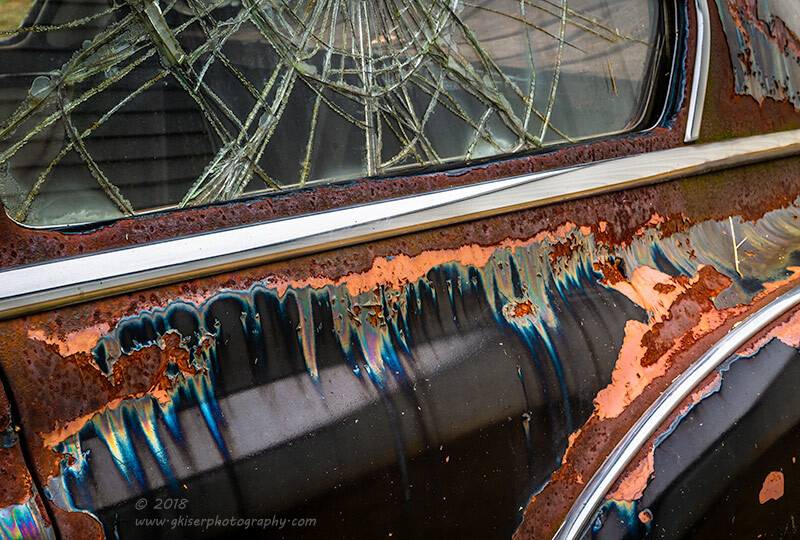 In an attempt to capture the awesome shattered glass once more, I worked out this composition that had lots of rust staining, abstract lines, textures, and just all around great patina. I'm usually not a fan of shooting black cars in this condition, but I have to say that this one is among my top choices with patina. 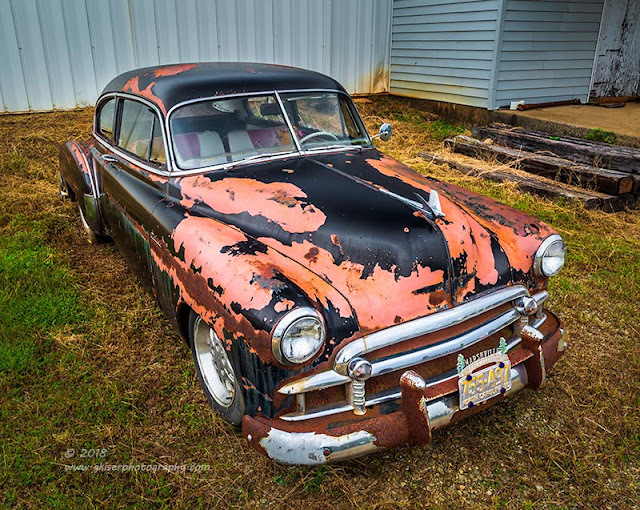 The contrast is just so perfect and the paint still has a good bit of gloss that really draws the attention to the rust. I'm so glad that I had the ability to get up close and personal with this car. Before I packed up the camera, I set up a shot that captured the steering wheel which still had the Bowtie emblem on the horn. The dash was pretty much in tact, and I was able to compose a shot that included the side mirror and hood ornament as well. The chrome of the door frame made a great leading line and frame for the cockpit as well. It is a little bit of a different image for me, but I'm starting to like doing them when the opportunity presents itself. 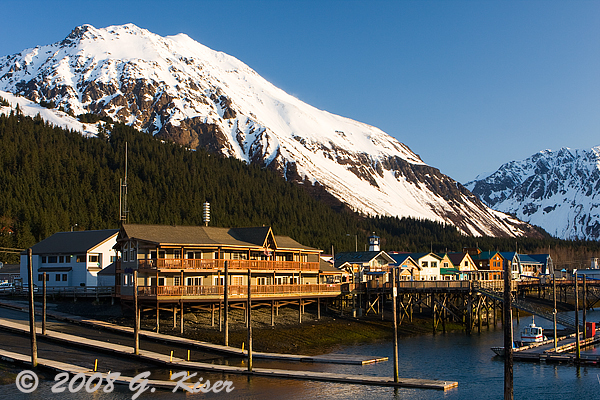 This is also a great example of what a polarizer can do for you. The glass is in tact for the most part here, and had a glare on it from the clouds. By adjusting the polarizer to this point, I was able to eliminate the glare and be able to shoot into the car with no issues. At this point, the property owner was finishing up mowing and was going around to the side of the building. I was pretty sure that I had gotten everything that I could from this location. I started to pack up and went around to let him know I was leaving. 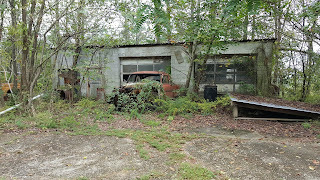 We chatted briefly and he told me about another location with some older cars and said that he would try to get in touch with the owner of that property. It sounds really promising, and I really hope that it works out at some point in the near future. By this time, I wasn't sure how many images that I was going to have as keepers, but I knew that I had shot a total of 72 frames, evenly split between the two locations. The first location I had been mulling over for a year or more and felt that I had a lot of good stuff from there. This second location was my alternate subject that I really didn't have much enthusiasm for. It turned out to be my favorite location of the day with lots of variations on compositions, not to mention three different cars to shoot. It really is funny how the success of a shoot doesn't necessarily relate to how much thought or planning had gone into it. I love that about photography, and it goes to show that to be successful in this game, you have to adapt to what is there at the time. Planning will only get you so far, reading the scene will get you the rest of the way.